Maintain endurance, reduce excessive stress level, assist arthritis symptoms, sustaining normal cognitive functions, upholding optimal male sexual performance maintaining healthy immune system. 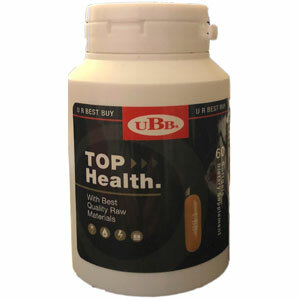 UBB Top Health is a health food manufactured from the best natural ingredients. This product may help to maintain normal endurance and reduce excessive stress level. It is also excellent for sustaining normal cognitive functions and upholding optimal male sexual performance. Use product daily to help achieve optimal results. Korean Ginseng has been extensively used to reduce cholesterol, adjust blood sugar level, enhance vigor, improve physique, eliminate chronic fatigue, relieve stress, help with bacteria infection and regain energy. Korean ginseng is the most effective anti-aging tonic that enhances immunity, mental responsiveness and male sexual performance. Antler Powder is especially effective for arthritis and arthrolithiasis. Helps with longevity, strengthens muscles and bones, enhances blood flow and immunity, and helps healing wounds in muscles and bones. Young Ji (Reishi Mushroom, or Ling Zhi) can restrain coagulation of blood platelets, helps with atherosclerosis, strengthen vascular walls, and relieve aches in muscles and nerve system. It does not cause harm to the kidney. Royal Jelly helps hyperlipemia patients control fat and cholesterol in their blood serum. In addition, it also relieves fatigue and vomiting, adjusts digestive system, relieves stomach ulcer symptoms, fights aging, and helps with various diseases in the liver, kidney, pancreas, and enhances immunity and helps with rheumatic arthritis. Maintain endurance, reduce excessive stress level, sustaining normal cognitive functions, upholding optimal male sexual performance, maintaining healthy immune system. Take 2 softgels daily, preferably after a meal.